Vocal strain is the most frustrating, agitating, and sometimes even painful aspect of singing... It destroys tone quality, restricts range, and turns singing into a chore instead of a fun activity. The big question is, "can we reduce our vocal tension"? Click play below to learn how to remove strain from your voice. In most cases, vocal tension is caused by bad singing technique. 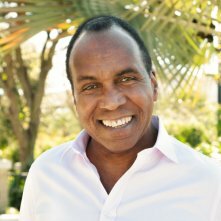 Once we learn how to sing with good technique, all of these vocal tension problems will disappear. Every note in our singing range should be accesses easily and freely, with no tension at all. You can watch a video about getting rid of vocal strain here. When you are singing correctly, it's almost like pressing keys on a piano... Each note can be pressed with the same ease... There is no pushing, pulling, or straining. The cause of most vocal tension comes from engaging the muscles that we use to swallow. They are the muscles located outside of the larynx (the larynx is the grouping of muscle and cartilage that houses the vocal chords). These outer muscles are called into action when the vocal chords are not receiving the correct amount of air pressure. With too much or too little air being sent to the vocal chords, the chords will not be able to hold together. The outer muscles then will attempt to tighten the chords, forcing the larynx up or down. This is where most vocal tension comes from. The unfortunate thing is, these outer muscles are extremely inefficient at controlling the vocal chords. While in some cases, they may be able to adjust the chords to vibrate at the right frequency, you will never produce your richest tone using these extra muscles to control your voice. The biggest problem with vocal strain / vocal tension is it limits a singers range dramatically. Great vocal range is developed by training your vocal chords to shorten as you travel higher into your range. This 'zipping up' action is commonly referred to as 'bridging'. Here is a video that will show you exercises that will increase your vocal range. By using the outer muscles of the larynx to adjust the vocal chords, your voice will get more and more tense as you travel higher into your range. By the time your chords need to zip up, your voice is so tense, the chords can not hold together any longer. Instead of zipping up (which is highly desired), they break apart and form a muscle coordination called falsetto. This is a lighter production which doesn't have the depth and power of singing on a zipped up chord coordination. The other alternative is worse... you use the outer muscles to push the larynx upwards to try and reach for high notes. It's almost like shouting! Please try to avoid singing like this. It can actually damage your voice... permanently. It sounds terrible, and does not feel comfortable at all. How can we reduce muscle tension? The first step to reducing muscle tension is quite simple and obvious, although many people overlook this simple practice. Warm up the voice before singing. This is a MUST if you want to sing at your best, and purest tone. Singing in a way, is just like playing sports. We use certain muscles to get the desired results. Just like running, singing requires the appropriate muscles to be warmed up. It's gets the blood flowing, and the muscles functioning more efficiently. Singing without warming up will limit the ability to hit and sustain high notes, while causing a tremendous amount of vocal strain. A fifteen minute warm-up on easy scales, in an easy range, should be effective in warming up your voice and reducing vocal tension. 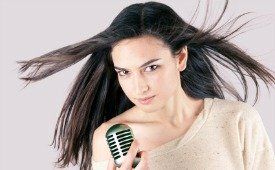 The biggest (and most common) cause of vocal strain is singing with bad vocal technique. A few years ago, I was a classic example... My technique was so bad that I actually began to develop vocal nodules. My voice would feel sore after ever session. I would actually feel my larynx spasm during, and even DAYS after a practice. It happened because I didn't know how to shorten my vocal chords in the higher regions of my range. I used to feel intense strain in my throat, and my jaw. The answer to correcting this, is training these outer muscles to relax while singing. The inner muscles of your larynx (the correct singing muscles) can then handle all the vocal chord adjustments, producing the tone much easier. As these muscles are developed, your voice will develop incredible range, and great tone, with no vocal tension at all. 2. Develop a technique that allows the outer muscles of the larynx to relax, while the inner (correct) muscles perform the vocal chord adjustments. This is done using exercises that allow our voice to relax and develop our correct singing muscles. 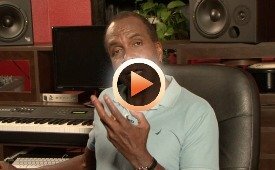 The very best program that teaches this technique in detail is Roger Burnley's Singing Made Simple. The Most Effective Singing Exercise Period.